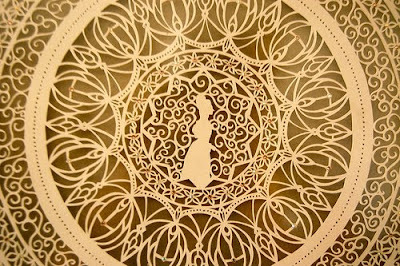 Unique paper cuts by Ruth Mergi are truly something to see. 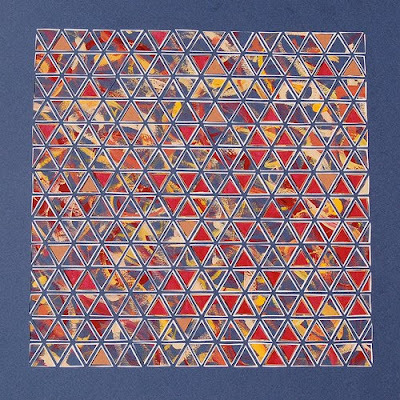 Ruth is an American-born artist living in Modi'in, Israel, who began paper cutting in earnest just a year or so ago. 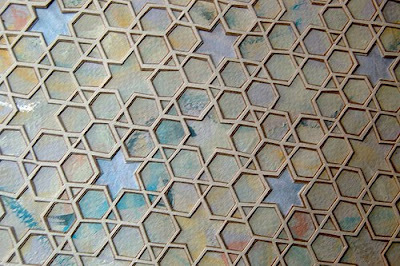 She works by hand with a compass and straight-edge to create intricate single-layer, multilayered, and painted paper cut designs. 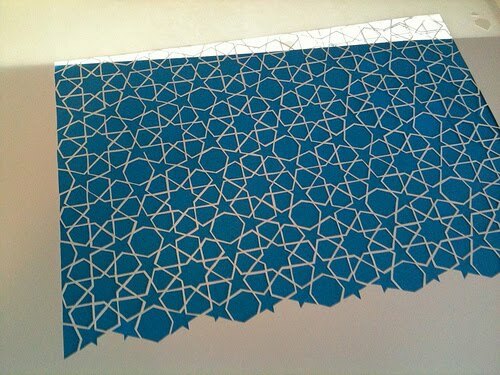 Ruth says she is strongly influenced by traditional Islamic motifs, as well as other spiritual traditions. 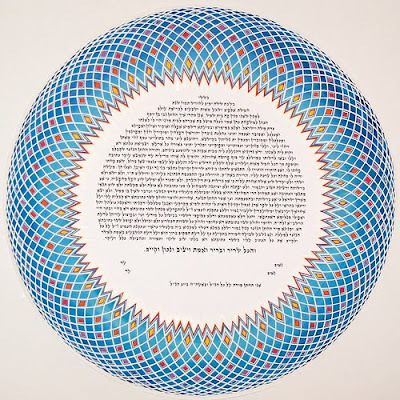 Recently she began creating original paper cut ketubot, which are Jewish marriage documents. This is her remarkable first design. 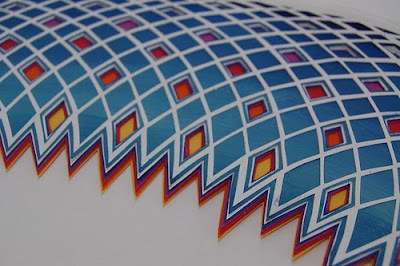 Ruth's work compelled me to ask questions about her creative process. 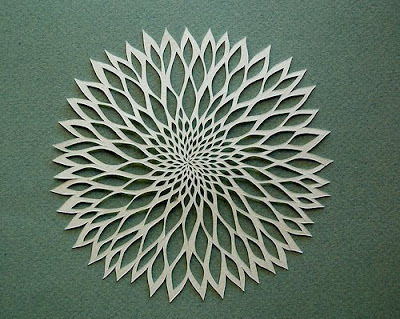 How did you begin doing this style of paper cuts? 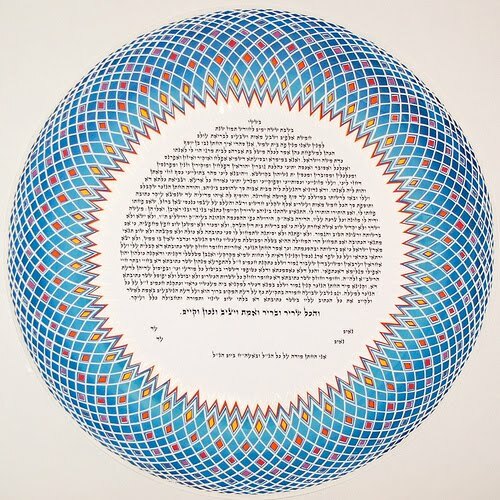 One of my biggest influences is the Judaica artist Archie Granot, whose layered papercuts are very well known in the Jewish art world. It's been trial and error, and I consider myself to still be in a very experimental stage. I've been building on what I've picked up over the years, and also intensely studying whatever I can learn online about paper craft. The above piece is a pattern from Qarawiyyin Mosque in Morocco. Ruth says she wants to create fifty of these and tile her walls with them. I wouldn't be a bit surprised if she does! Oh gosh, let's see. I was introduced to paper cutting in high school, almost twenty years ago. An artist named Tamar Fischman came to my school and did a little workshop during my senior year. I loved it from the start. At UC Berkeley, I majored in philosophy, but made an effort to take art classes when my schedule permitted. After college, I traveled in Europe and India, lived in Israel for a time, worked as a journalist, and then went to law school in the U.S. My oldest son was born while I was in my last year, and after graduation I moved back to Israel, and here I've stayed. I did some legal research for a while, but never practiced law. In the meantime I stayed at home with my son, my two daughters were born, and I tried to figure my path. Hand-cut paper, Swarovski crystals 18" x 18"
About a year ago I had a "wake up call" and realized that I was an artist after all. I set up a studio in the basement that same week and have been at it since. It's a challenge with three small kids at home - they are aged six, four, and not yet two - but I know this is the right path for me. Can you explain for us how you go about your layering process?For the most part, it's very straightforward. I glue the top layer to an under-layer, and then cut *that*. And I keep going until I'm done. Very low-tech, but labor intensive, and although I'm still working out the kinks, I have to say I find it satisfying! You mentioned on your Flickr page that you would be sending a piece off to be laser cut. So far I've only worked by hand -- no computers, no photoshop, no lasers. Recently I had a couple of pieces reproduced by lasercut, and am going to add hand-cut layers and paint to work those into new pieces. It should be a fun experiment. Have you found a particular craft knife that is most comfortable to use? 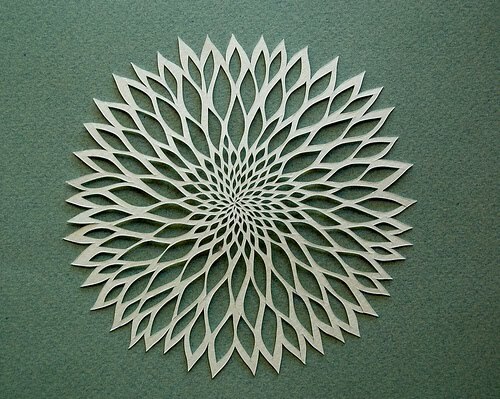 I cut with a regular old X-Acto knife, #11 blade, for the most part. How are your hands holding up? I would imagine the tedious, fine cuts must be pretty hard on them.My hands are fine, it's my eyes that hurt! One of my daily frustrations is having to take breaks when my eyes start to glaze over from the strain. The hands are willing, but I have to rest every hour or so in order to see properly. It's a challenge to get enough done while the kids are at school and daycare, which keeps me on a very tight schedule, but that's not an entirely bad thing. The kids do keep me motivated! Stay up-to-date with Ruth's newest projects via her website and Etsy shop. This work is spectacular. Thank you for bringing it to our attention. Her work is truly incredible! We live in the same city and I am dying to see her amazing work! Spectacular work. So much detail in there. 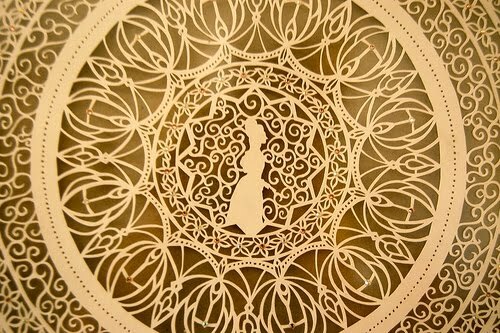 I've never seen paper cutting like this. I love to do single layer cuttings- now I'm definitely going to explore the possibilities of layers cuttings because these are fantastic! Wow, her work is fantastic! so much patience. Thanks for sharing. Mind blowing! I am glad you asked about the hands I was wondering that also! Gifted! Truly truly Amazing ,And how inspiring!! Thanks for an amazing post Ann. The piece labelled mind's repose -so intricate and delicate.what a great talent! Ann, thank you for the lovely profile -- I'm honored to be featured on your site. And thanks to all for the wonderful comments. I really appreciate all the kind words. Very encouraging! Congrats to Ruth on your career change and the cutout artworks are so intricate !!!!! May you find lots and lots more free time to persue your art and skill!! Simply jaw dropping spectacular! I posted this link to my facebook page this morning. I always enjoy "All Things paper." Nice interview and beautiful work. As soon as I saw the first piece I immediately thought of Archie Granot. It's ironic that I usually learn about Israeli artists from other people's blogs. 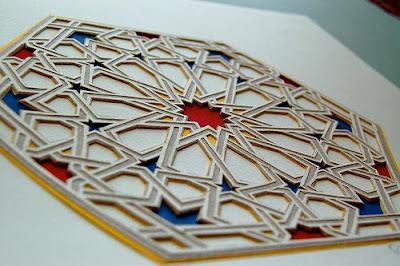 :-) Thanks for introducing us to another talented paper artist! Thank you for sharing. I love them all, very very good work. Uuuh. A LOT of work!